When your internet goes out, resetting your wi-fi router and cable modem often seems to fix the problem. Instead of getting up from the couch to fiddle with power cords, why not let a tiny outlet adapter power cycle your hardware for you? You might balk at the ResetPlug’s $60 price tag, but it’s not an awful idea for people who hate having to get up when the internet goes out. 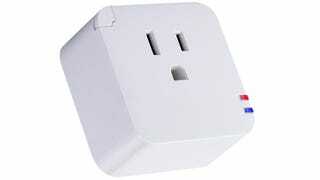 You plug the device into an outlet, and then plug your wi-fi router, modem, or both, into the ResetPlug itself. It constantly monitors your home’s internet connection, and when it detects a problem, it automatically cycles power to your router and modem until the internet returns. You don’t even have to reach for a remote, or bring up an app on your smartphone to trigger a power cycle. And even if you don’t think you need one for your own setup, imagine how few tech support calls you’d get from your parents if you were to install one of these in their home? Ahhh, now you’re seeing the value in the thing.